The holidays have already passed. Sooner than later, we’ll say goodbye to the cold weather we’ve been enjoying these past few months and give the warm summer sun a big fat welcome. Before you know it, it’s time to schedule summer activities once again. Keep those boots in your closets and bring out your flipflops! I’m not talking about those tacky or bulky flipflops by the way. Those, you can keep in your closets together with your boots. Better yet, throw them out. Flipflops are meant to be casual and comfortable but they don’t have to look ugly. My choice? 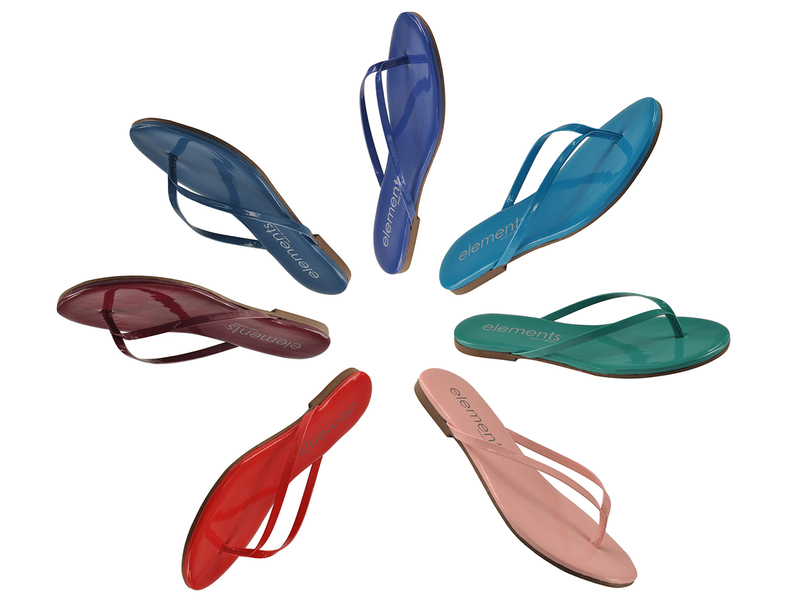 Slim-fitting footwear in beautiful colors and material like those by Elements. Drawing inspiration from colors found in nature–from warm earthy tones, to vibrant summer shades, to cool water hues, Elements has a color to suit every mood and personality. Since the brand makes use of only the finest leather from Brazil, each pair promises all-day comfort. Elements is founded on the philosophy that people are “in their element” when they look good and feel good. People are able to feel good about themselves when they are comfortable with the way they look and can express themselves through what they wear. Everyone deserves to be “in their element”–and Elements helps make that happen. 2. Like Elements Philippines on Facebook and follow Elements them on Instagram (@ElementsPhilippines) and/or Twitter (@Elements_PH). If you don’t have an Instagram account, Twitter and Facebook will do. 3. 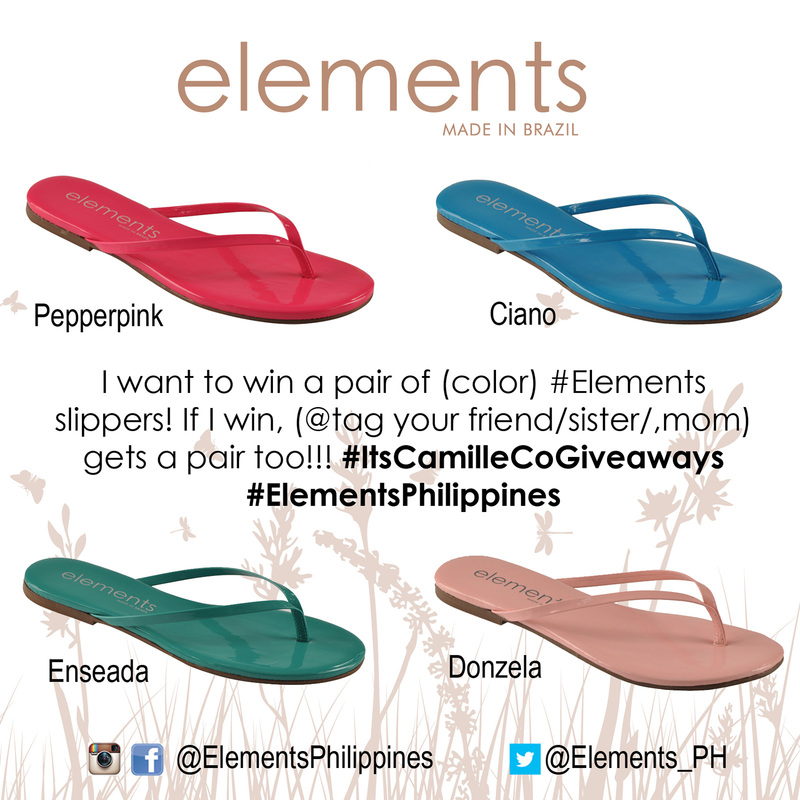 Like the photo below on @ElementsPhilippines’ Instagram page and repost it with this caption: “I want to win a pair of (insert your color of choice) #Elements slippers! If I win, (insert your friend/sister/mother’s @account) gets a pair too! #ItsCamilleCoGiveaways #ElementsPhilippines. *** If you don’t have an IG account, you can skip step #4. 4. Post the same caption on your Facebook and Twitter. Make sure to tag the right Elements Philippines accounts. If you didn’t do step #4, post the photo on these channels as well. 5. Leave a comment below with your Facebook, Instagram and Twitter names. Three winners will be chosen for this giveaway–one each from Facebook, Twitter and Instagram. This means you can enter thrice. This contest is open to Philippine residents only. Deadline for entries is on January 30, 2014 at 11:59PM. I will be choosing the winners via Random.org and announcing them here at the comments section below. If you are one of the lucky winners, you will be asked to choose between US sizes 5-8. The color of your prize will then be based on the color that you state in your status (subject to availability). Elements Philippines will also be contacting you regarding the color of choice and size of your friend/sister/mother whom you tagged. Elements is available at selected Shoe Salon branches. Prices start at P1895. I’m size 9 1/2. But I’m still hoping that size 8 would fit. But I hope I’ll win first! :) Hehe. Oh no! Let me check that! Yes but they’re US sizes so maybe a size 8 would fit?